Summer is coming and at this time of the year you can enjoy the Eternal city 24 hours a day. Visit the Colosseum under the Moon. The Moon above Colosseo is the main event of the summer archaeological season: you will walk through the moenument, reaching the most important spots, included the underground. The visit, which lasts 75 minutes, is organized in groups led by an expert and will show you the arena floors, the underground tunnels where gradiators and wild animals waited before appearing in front of the public, the technical apparatus lifting humans and animals from the undergraound arena. The tour includes also the exhibition Constantine 313 d.C celebraiting the anniversary of the manifiesto of religious tolerance also known as the “Edict of Milan“, with a particular view of Rome at the time of this Emperor. 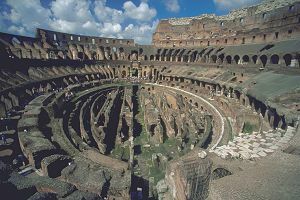 The tour continues under the moonlight to the top of the monument overlooking the entire auditorium and ends on the lookout Valadier with a spectacular view of the Arch of Constantine and the slopes of th ePalatine. You can´t miss this chance!! Previous Post GO SAN FERMIN!